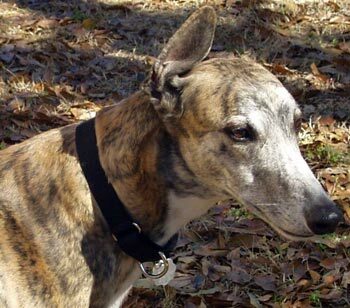 Faster is a handsome, 6-year-old, brindle male born February 3, 2004. His sire is the famous late Gable Dodge, and his dam is Fast Melody. 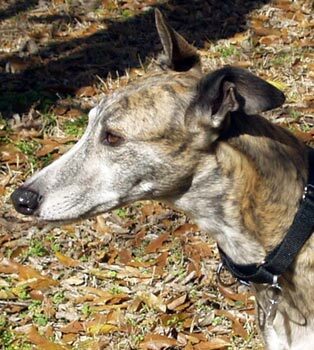 Faster has 98 races to his credit on Greyhound-Data.com, starting December 5, 2005, and finishing May 4, 2007, all at Corpus Christi race track. Faster, along with Will, were part of an adoption group that closed down due to the personal illness of its director. Faster has been in a foster home for at least 6 months, and he has very, very good manners! It is not known at this time if Faster is small animal or cat tolerant. In his foster home, Faster enjoys the company of his three male greyhound brothers and his female rescue Rottweiler sister. They have the run of several rooms in the house when left alone. Faster learned the ins and outs of the dog door in less than two days, and if taken out between 10 and 11 p.m. to take care of business he is fine through the night, sleeping soundly next to our bed. His favorite activity is mealtime, and he paces eagerly when he hears the food dishes rattle, wagging and occasionally whining to suggest you hurry. When he sees his dish coming his way, he dances his thanks. 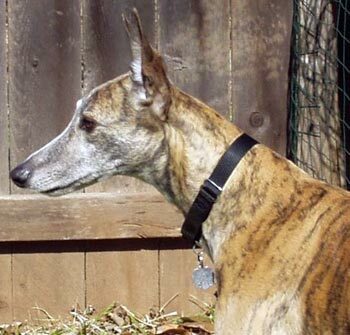 Like many greyhounds, Faster has not yet learned to play with many traditional doggie toys, but his curiosity keeps him busy and active. A Nylabone or rope toy makes him very happy. He also enjoys a walk or a ride. Indications are that Faster is not cat- or small-dog friendly, but he’s never met a human he didn’t like.